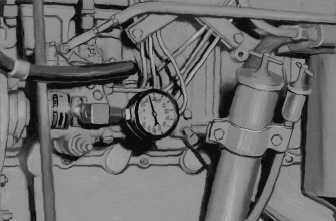 Figure 5-16.-Gauge installed for checking transfer pump pressure. 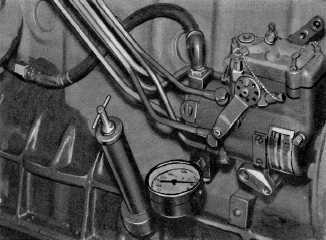 Home > Construction Training Manuals > Construction Mechanic Advanced > Figure 5-16.-Gauge Installed For Checking Transfer Pump Pressure. Since most tests are more conveniently made under no load conditions, all possible readings are determined at high idle. If the supply pressure is lower than normal, an engine can still operate smoothly at approximately the correct high-idle speed. The governor opens the metering valve further to make up for the lower pressure; therefore, you can take successful readings at high idle. First, disconnect the throttle linkage. Then, with the engine running, hold the throttle lever all the way to the rear. Adjust the high-idle stop screw until the specified high-idle speed is obtained to test the fuel pressure at high idle. Install the gauge assembly in the pressure trap of the transfer pump, as shown in figure 5-16. If this reading does not fall within the prescribed range, the pump will not deliver sufficient fuel to obtain full power under load. The most common causes of low pressure are restricted fuel supply, air leaks on the suction side of the pump, worn transfer pump blades, or a malfunctioning regulator valve. Figure 5-17.-Testing pump housing pressure.